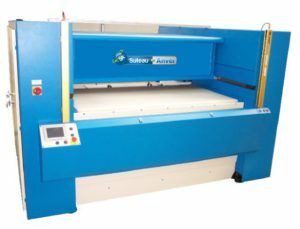 Suteau Anver is recognized as a worldwide leader in die cutting machines. 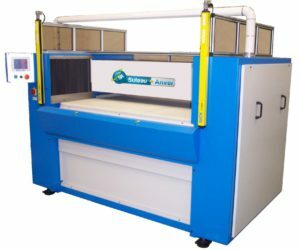 The range of our machines is very large, and contents as well hydraulic die cutting presses, mechanical cutting presses, cross cutting and kiss cutting machines. From our small clicker press (SA F60) with a power of 27 tons and a working area of 500×500 till our VFS machines with 500 tons power and a working area of 3000 x 3000 mm, Suteau Anver can respond to the most various requests of our customers. PTMV range: reliable and affordable receding head die cutting presses from 25Tons till 100Tons power and cutting area from 1600 x 600mm till 2000x900mm. 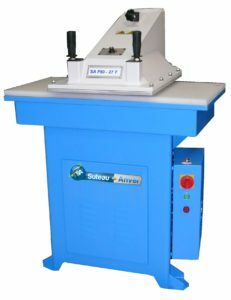 These machines are equipped by 2 table cylinders and 1 main cylinder for perfect parallelism of the table against the beam. XPM range: Our “state of the art” receding head die cutting presses, coming into a 2 or 4-cylinder version and available with a power till 300 Tons. Also, available in a Design version this machine range is today considered worldwide as outstanding. VFS range: The movable beam range and cutting on conveying belt. This unique concept is used where productivity and reliability are a real must: automotive, packaging, converting industries and flooring industry. With a high production output: till 17 strokes/min and a huge power till 500 Tons, this range of machines will fit the most requirements of our end customers.